Thomas S. Monson is the new prophet of our church. This picture here is not so recent. He looks a bit older these days. 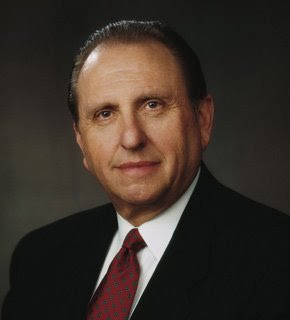 I have always loved President Monson. My brother, Thomas, was allegedly named after him! He always has great stories and wonderful analogies when he speaks. He gave his first addresses to the Church today at our General Conference that was broadcast around the world. Here is a link to his talk that he gave in the closing moments of the last session of the conference. This is an audio file so you can listen to him speak, it is not a video. President Monson's Talk He was very much in good humor and spirit. I know we all breathed a little relief when he cracked a few jokes. It is nice to have a prophet that believes in humor and laughter. I am excited to learn more about him and what his focus will be to push forward the work of the church. I know he was called of God. He has been and will continue to be a great leader in the years to come. How great that I found this blog...I was curious to see how your family was doing so I "yahoo'd" you and your blog came right up! Your beautiful children have really grown up. It's been a long time...thanks for the fun updates. Your family really knows how to have a great time!